tyI love making people feel good but, admittedly, gift giving and receiving is not my love language. I’ve had to learn the value of it in business, which I’m thankful for. Each month, I get a little better at it. I’ve started making sure that writing handwritten notes and sending little gifts to my customers, clients and business partners is a part of my regular routine. I love getting creative with what I give. Each month I pick 10 people that I want to make feel really good and let them know that I’m thinking about them. This, I believe, will make them feel valued as a customer and want to continue to work with me. 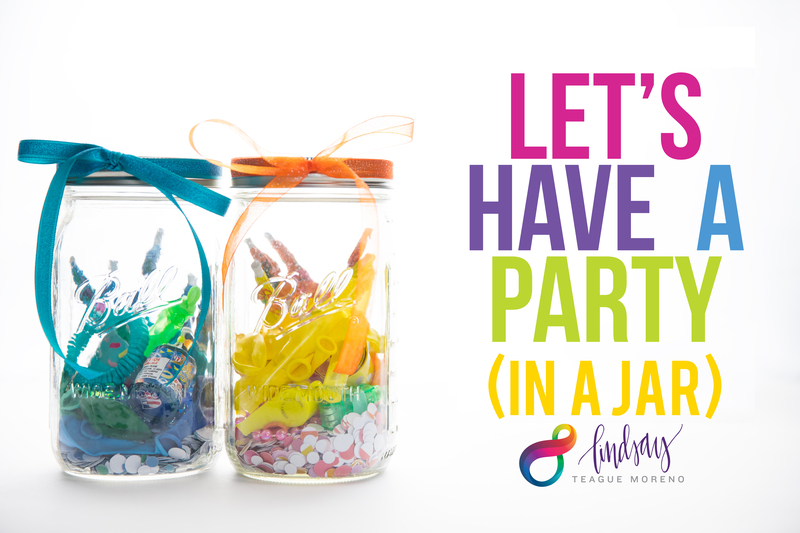 This month, I created a Party-In-A-Jar to give as my gift. In each card, I wrote something I was virtually celebrating with them (job promotion, exciting news, new baby, etc) or told them to keep it on their desk until it had been “one of those days.” That way they could have a little party and pull themselves out of their funk. This was insanely easy to do with a few clicks from Amazon. You ready? That’s it! Just punch your confetti, put everything by color into different jars and then move onto printing and applying the label on the lid. CLICK HERE to download a free copy of the Let’s Have A Party (In A Jar) label sheet for you to print off onto the Avery 22830 Labels. Put the lid on your jar and throw some of your coordinating ribbon around the top. Put the label on and you’re good to go! Don’t forget to write a handwritten note and put your business card into the card to go with the jar. It’s so important. I would wrap each of the jars in bubble wrap and put them inside some matching tissue paper. For your out of town friends, throw them into a Medium Priority Mail Flat Rate Box. Seal & Send. Wonderful idea! I know so many people who work in traditional jobs and can probably use this every week! Love this idea. And THANK YOU! I’ve been wanting to start a “Care Club” of sorts and send something to my customers/team each month, but I keep getting hung up on the “to who” and “how many” issues. 10! I know it’s silly, but sometimes having someone else just shout out a number is all it takes to break the overthinking cycle. Oh my goodness.